Join us for Loop for Literacy! Enjoy family friendly activities for kids of all ages. Proceeds benefit the programs of the Literacy Coalition of Palm Beach County that ensure that adults, children, youth and families gain the literacy skills necessary to succeed in life. Online registration is encouraged and closes February 2nd at noon. Same day registration will be available February 3rd rstarting at 6:00 a.m.
Ride begins in the park at 7:00 a.m., course goes onto the road and ends in the park. 5k run begins at 8:00 a.m.
5k walk begins at 8:15 a.m.
Ride inside park begins at 9:00 a.m.
PACKET PICK-UP - Packet pick-up dates and times to be announced closer to the event date. Get rewarded with a Loop for Literacy baseball hat OR a Literacy Coalition travel charger. 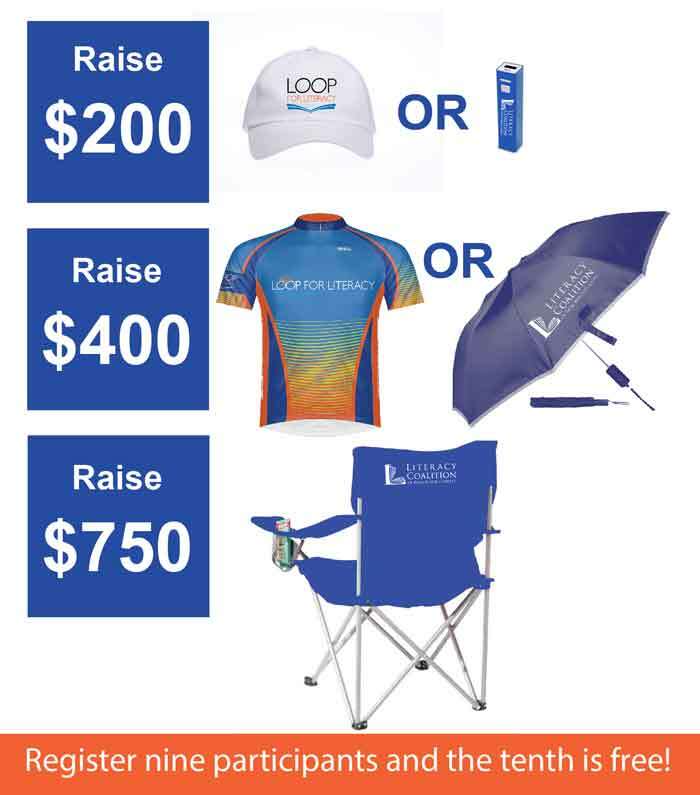 Get rewarded with a Loop for Literacy cycling jersey OR a Literacy Coalition umbrella. Get rewarded with a custom folding portable chair AND choose from: a baseball cap and umbrella or a Loop for Literacy cycling jersey. Register nine participants and the tenth is free! Give a child an early start and help families and adults improve their quality of life by giving the gift of reading and literacy. The Loop for Literacy event supports the vital programs of the Literacy Coalition of Palm Beach County. When you register please fundraise and spread the word to fellow athletes. By doing so, you will ensure that children and adults gain the skills they need to succeed in school, work and life. Get involved and make sure that everyone who wants to learn to read, can. For information on the Coalition's programs, visit www.LiteracyPBC.org.